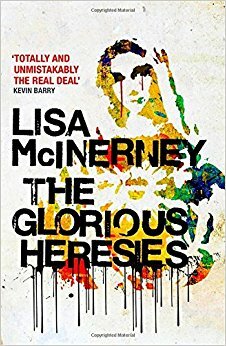 There was not a general consensus on the novel other than (I think) that Lisa Mcinnerney was well deserving of the awards she received for this first work. We had mixed reactions towards the characterisation in the novel. Some found empathy for the characters and others not – but all agreed this was a very character-driven piece. Admittedly actually finding hostility rather than empathy towards some of the characters suggesting she did accomplish something. Ryan did stand out as the character most evoking of this empathy and particular notion of vulnerability and cloaking being particularly well captured. I for one did not finish the book and it was raised that the audible version was noted as really being a separate novel – particularly well narrated. I do intend to take a little time with it. I would be very interested Joe to hear where you found yourself with the novel. There is no denying that Mcinnerney was very adept at creating a particularly rich and vibrant atmosphere – for me it was just not one that I wanted to spend to long in. One aspect that emerged in addition to our written submissions was wondering whether the well crafted phrases were really one’s that suited many of the characters or were merely a stage for the author to play and express herself through. With usual apologies for missing anything and also allowing the previous written submissions to stand on their own. Thanks again for those. I can’t make up my mind about “The Glorious Heresies” (a play, I presume on the Glorious Mysteries as part of the Rosary). The characters are certainly colourful but somewhat difficult to empathise with. “Another string of piss” is part of the description of the dead intruder whacked over the head with the religious relic near the start of the action. I think the novel suffers from a problem with its tone. Where is it pitched at? It’s clearly meant to be funny but, if so, it is not consistently so and becomes distinctively dark in places. One reviewer described the tone as “sardonically funny” and that is a problem with satire; unless it’s well controlled and consistent, it can topple over into bleakness. There are some very witty phrases and descriptions, such as a brothel in Cork being “the Munster Moulin Rouge”, “a lout with a belly out to next Friday”, the fellow with a head of hair on him “like a mushroom cloud” and the “ould wan” with a face “that would have reversed the course of the Grand National”. This gets a bit tiresome after a while and reminds me of the musical “Oliver”: too many cheeky, cheery chappies wisecracking. McInerney herself is, of course, the greatest wisecracker of all. Are the tone and the language a bit at odds at times with some of the complex moral issues raised and do they (tone and language) militate against taking those issues in any way seriousl?. Also, at times it’s hard to accept that some of the situations created could be plausible. Towards the end, I think the story flags a bit. Ryan, the secret piano player (however believable that particular scenario is) morphs into Ryan the DJ. He was preferable in his previous incarnation. Apologies for not making this, so here is the score from the Portuguese jury. First impressions are another ‘Casual Vacancy’ – ‘kitchen sink’ drama with overtones of ‘Orphan Master’s Son’ violence. You can gather I didn’t particularly like it and had a struggle to persuade myself beyond about 20%. Redeemed slightly by occasional flashes of dialogue which to my (alien) ear did have the authentic Cork flavour and by a reasonable plot and structure (‘Casual Vacancy’ again). No real sympathy for any of the characters, even the (anti-)hero and thought the ending was a somewhat arbitrary stop. Or was that supposed to denote a metamorphic ‘coming of age’? …for a perfectly respectable 7. So to next month’s non-fiction read. Mike’s suggestion carried the day and so we are off to explore J.D. Vance’s Hillbilly Elegy … tune in next month. ← Report on Enough Said: What’s Gone Wrong with the Language of Politics?